In a project to increase safety, Rotork Skilmatic SI electro-hydraulic actuators have been installed in the Joint Users Hydrant Installation (JUHI) fuel storage depot at the Sir Seewoosagur Ramgoolam (SSR) International Airport in Mauritius. Replacing obsolete electric actuators from another manufacturer, the Profibus-enabled, ATEX-rated failsafe Rotork actuators have been installed in critical valve areas to prevent potential spillages by automatically closing-off the flow of fuel on receipt of an overfill alarm signal. Skilmatic self-contained actuators have been specifically designed as the reliable solution for this type of vital failsafe application. The actuators combine the simplicity of electrical operation with the precision of hydraulic control and the reliability of mechanical failsafe action, utilising an integral spring mechanism to provide the most reliable means of positioning a valve to a pre-determined safe position. 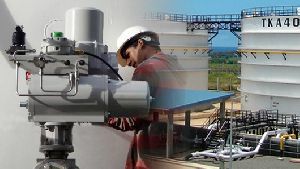 Incorporating an intelligent control and monitoring system as standard, SI actuators provide an ideal solution for two position or safety shutdown duties in Safety Instrumented Systems (SIS) or precise modulating control applications. In addition to the Profibus DP control, Rotork datalogging and monitoring options provide a valve signature profile and historical record of valve torque demands. Using the Rotork non-intrusive intrinsically safe Bluetooth® setting tool, these configuration and datalogger files can be transferred from the field to a standard PC for analysis as part of the asset management programme. The actuator installation was performed by Rotork’s South Africa office and their Mauritian agents, local company Electrical & Control Specialists Ltd., whose responsibilities encompassed removing the old actuators and cabling, designing and fabricating new valve adaption, fitting the Rotork actuators, wiring-up and commissioning. Find out more about the Skilmatic Range.